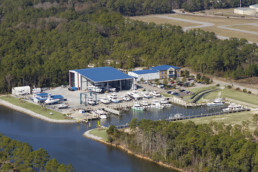 In 2012 we opened a brand new, full-service boatyard on 14 acres along the Gulf Intracoastal Waterway (ICW) in Gulf Shores, Alabama. The facility accommodates vessels up to 130 feet in length, provides robust dockage and long-term dry storage, and features the largest lift capacity for recreational boats in the northern Gulf of Mexico. We designed our fully-enclosed works building to include a 50-foot door height, which accommodates custom tuna towers. Next to our works building, a 13,000 sq. ft. covered space allows us to stage a greater number of vessels in a weather-protected environment. Our carpentry and machine shops are strategically located between the works building and covered space in order to boost work efficiency.